Overall Condition Good to fair. Most of our pieces have spent decades on at least two continents, and have been treasured by several owners. Please look carefully at the pictures which may also reveal condition and damage. 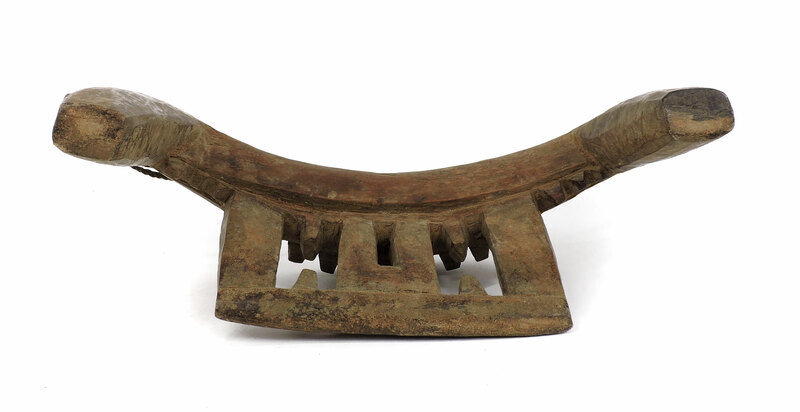 Additional Information: A Dinka headrest in a very stylized zoomorphic shape. One end has a functional tobaco pipe bowl. 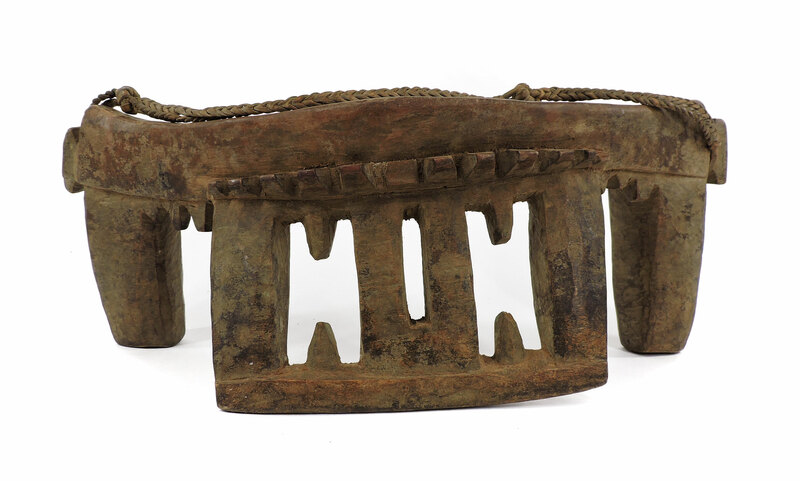 This is a three-legged headrest with a beautiful dark brown warm patina showing some wear. The Dinka are a herder Nilotic group which is a group of peoples from the Nile Basin speaking Nilo-Saharan languages, which are part of the northwestern Congo, Western Ethiopia, Southern Uganda and Kenya, northern Tanzania, and South Sudan. These groups move according to the seasons from place to place in the search of water and gazing land for good pasturage. The Dinka inhabit the vast savanna of South Sudan in Africa. Although the Dinka are the largest ethnic group in South Sudan, their historical background remains obscured. As far as we know, the Dinka settled in the area around 1800 and often have been often in conflict with their neighboring peoples, such as the Atuot. Their reputation as redoubtable warriors comes from their successfully defense against the Ottoman centuries ago. Being a Valiant warrior is an important value the Dinka transmits to the youth. This value is taught through the initiation of young boys. At the end of the initiation, the boys are presented with a spear, a club and a shield, the equipment of a warrior. The lifestyle of the Dinka is that of the nomad and herders. Today Dinka people raise cattle and practice agriculture. Little is known about their art. However, Dinka personal and body adornments are among the most astonishing on the all continent. The Dinka nomadic lifestyle is reflected in their art. In fact, the Dinka have excelled in the production of small objects, easy to carry. Stools and headrests are among these precious objects. 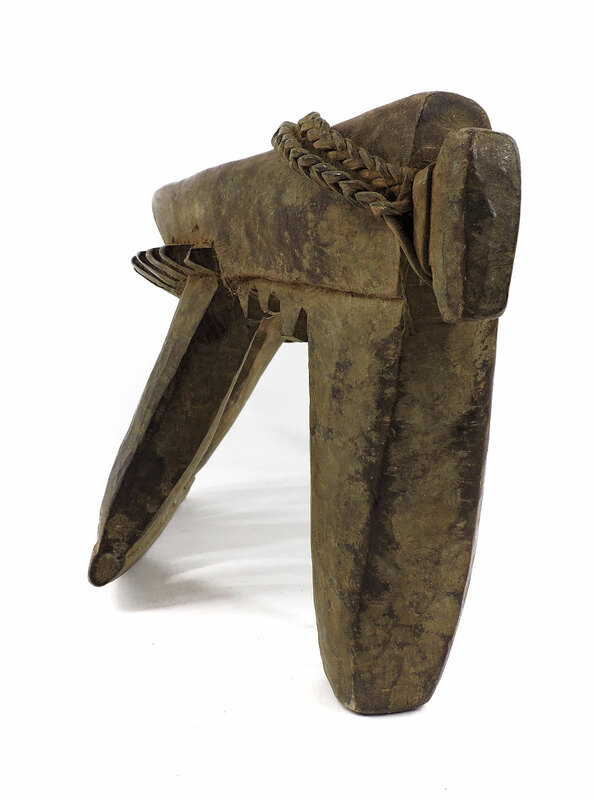 Dinka headrests or neck rest are carved from a single piece of yellowish brown wood and consist of three to four-legged stable feet, sometimes carved separately from one another. In most of the cases like here, the all piece is made from one single piece of wood. The upper level parts have various forms and usually narrow curved with rounded corners, slightly concave along its length and convex across its width, with a convex underside. Some have zoomorphic motifs which include birds, antelope, and giraffe.